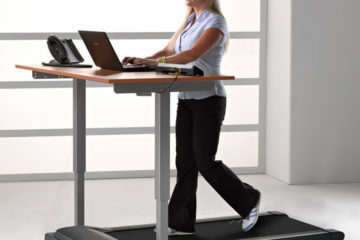 Well, the next step, if you’ve looked at our ideas for exercise equipment for the office, is a treadmill desk. No! Of course not (well, there is that option, but it’s not the only one). In fact, treadmill desks come in a variety of types, shapes, sizes, and offer different functionalities. If you want to find the best under desk treadmill for your office, then you’re in the right place. When you are choosing the right option for you, it is important to have numerous details in mind to get the best of this device. This article serves as a guide where we will provide you with some insightful tips that will help you make up your mind and find just the thing that will meet your requirements. Not interested in all the minor details and just want to see the best treadmill desks? Have a look at our list of top rated under desk treadmills. 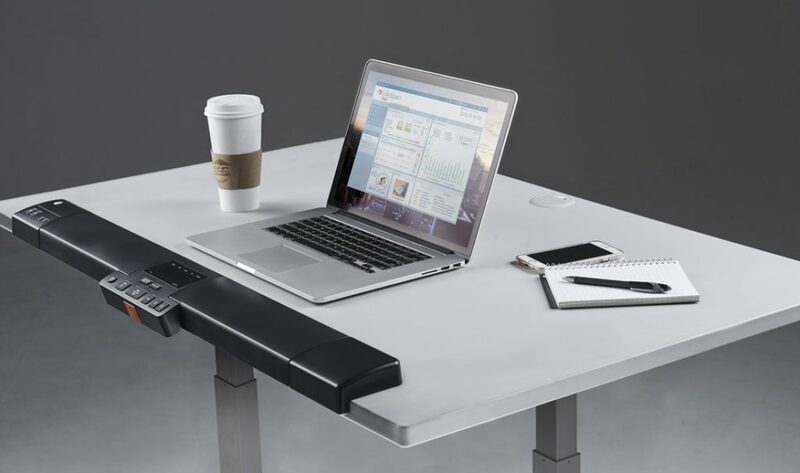 The InMovement Treadmill Desk is a fixed unit with the desk section and the treadmill platform joined together. Fixed treadmill desks are pretty self-explanatory, in short, the upper desk section is connected to the treadmill platform. Basically, a product like this is designed for one thing, which is walking or running while you are working. You do not have the option the remove the treadmill from the desk, nor will the desk stand on its own. However, this is not necessarily a problem. 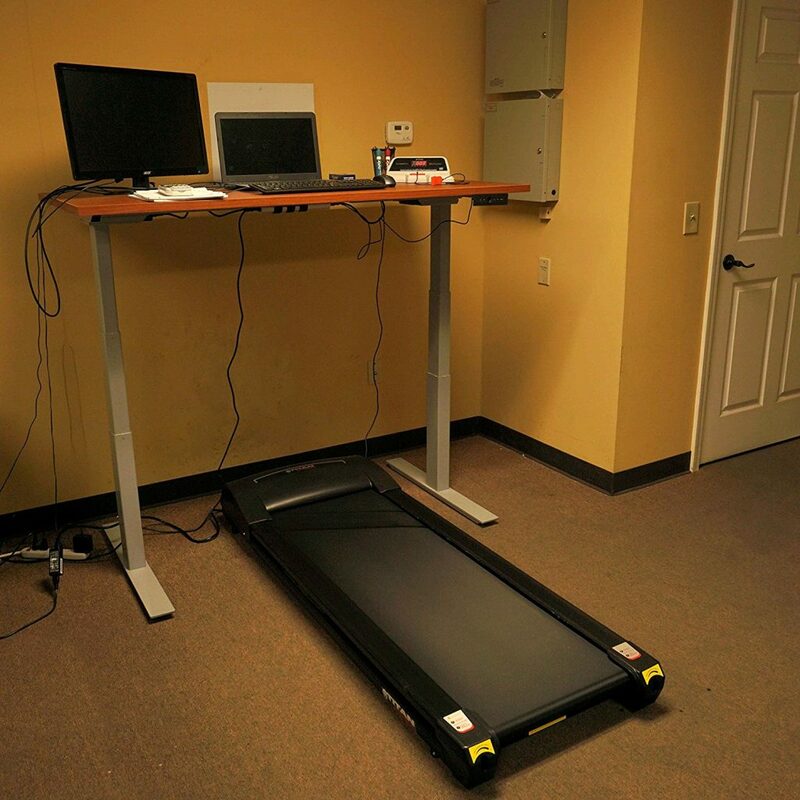 Fixed treadmill desks often have the full functionality of standard height adjustable desks, that is a mechanical or electric sit-to-stand mechanism for full height adjustability. For example, the InMovement Treadmill Desk has the ability to vertically lift to suit people between 5 ft and 6 ft 4 inches tall. The main issue is that it would be difficult to use this type of treadmill desk for seated work, in fact, you are more or less forced to stand at all times. This doesn’t mean you have to be walking or running, as you can obviously just stop the treadmill and use the platform to stand on. If you are 100% that you want to make the conversion to standing desks, and will never look back to seated work again, then we highly recommend this style. As we mentioned, some people like the flexibility of sit-to-stand height adjustable desks, but if you’re never going to sit, then, in fact, this product makes more sense. With a fixed treadmill desk you only have to invest in one product, which will probably make it cheaper for you (depending on the products you choose), rather than buying a tall standing desk (yes, it will have to be tall to fit a treadmill underneath) plus an under desk treadmill. The main issues with the fixed treadmill are not being able to sit, and it is rather bulky so you’d have to make sure your office is big enough first. An under desk treadmill like the Titan slides easily under your current standing desk, and can be put away when not needed. If you’ve already bought a standing desk, then great! You’re halfway there! So your option now is something like the Rebel Desk under desk treadmill, like a regular treadmill but completely stripped of its arm rails so it can fit snuggly beneath your desk. As we mentioned earlier, the major issue with the other style of treadmill desk, is that it really has only one function. This way, on the other hand, you have the choice of using you standing desk in a number of ways: sitting down, standing up, or with the treadmill underneath. It is important to remember that the main reason for having a standing desk in the first place is so that your back and neck are nice and straight and you don’t hunch while working. Have this in mind when you get an under desk treadmill, as they will typically add around 8 inches to your height, so you really need the tallest standing desk possible to allow you to work comfortably. Lastly, it is worth pointing out, that an under desk treadmill is NOT a substitution for a standard treadmill. 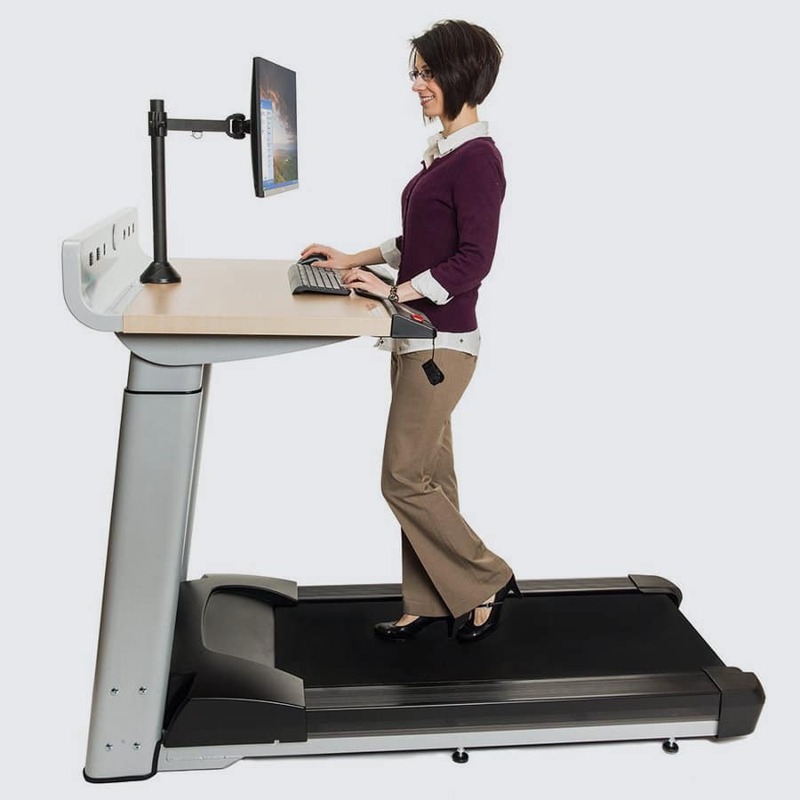 Many treadmill desks only have the option of walking, therefore will have a max speed of 4mph or thereabouts. Ok, so we’ve had a quick look at the types of standing desk treadmill that you can choose from, now let’s take a look at some of the other features that you need to take into consideration when buying a new treadmill. 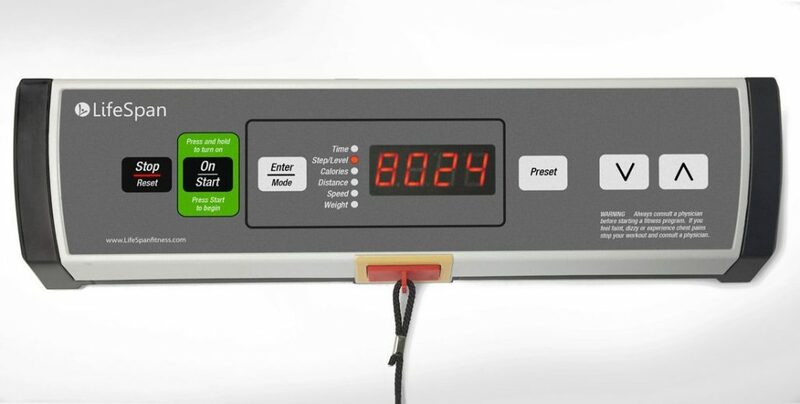 When you are running on a treadmill, the belt of the treadmill is being pushed backward. If you are walking at the speed of 2 mph, this belt works by pushing your body weight while simultaneously overcoming the friction which happens between the deck and the belt. Torque is a force which turns the belt rollers and it is measured in horsepower, much like a car. When you are deciding on a product, make sure to look at the continuous horse power, as this is a much better indicator of what the motor is capable of. Most treadmills have a range between 2 HP and 5 HP, which should be more than enough for walking at a standing desk. Be wary that, the heavier you are, the more friction you create between the treadmill belt and the treadmill, and as such the more overall torque required. Below we outline the basic principles for the required torque for a treadmill. If you choose an under desk treadmill with an insufficient amount of torque, you will experience a discomforting pulsating feeling when your foot is on the belt. It might also feel like the belt is “sticking” and your overall experience will be a lot worse. Most importantly, it is best to select a product with a motor that has a long warranty. Although you shouldn’t expect your new treadmill to break at any time, it can happen. The motor is the part most likely to fail with many moving parts and the fact that it is under constant stress, so look for warranties that cover you for any manufacturing faults. The size of the treadmill platform is certainly an important feature for people who want to walk while working. The average treadmill height varies between 6 – 10 inches, and this additional height must be compensated by your standing desk. If you are selecting a fixed standing treadmill desk, then they will most likely accommodate the average user from 5 ft 6 inches to 6 feet. For smaller users, the belt size shouldn’t be too much of an issue, however, for taller users, you may want to look at longer treadmills so you can stride comfortably. The belts usually have a length somewhere between 55 and 60 inches. Remember, you will need the belt to be longer if you plan on running as your strides will be longer, but if the treadmill will only be used for walking, then a shorter treadmill belt will suffice. The other size factor to look out for is the width of the belt. Some users prefer the wider belt for comfort (if you have a wide gait), and for safety reasons (with a wider belt you are less likely to fall laterally). The standard belt width is around 20 inches, and can vary a couple of inches north or south of that size. Well, firstly with a fixed standing treadmill desk, the console is most likely fixed into the desk and you will not have much choice of its placement. The fixed consoles are simple and usually in the corner of the table so will not get in your way. The second option is the treadmill bases which have their console attached freely, so you can place it on your standing desk. This style of console can be seen in the image above. Again they are very small an should easily sit on top of your desk. The only consideration with these is your cable management. Loose cables around a working treadmill maybe aren’t the safest idea, so better attach the console to the desk and tie the cables to the table too. Lastly, if you want to invest a little more money, you have the choice of a dedicated treadmill desk. 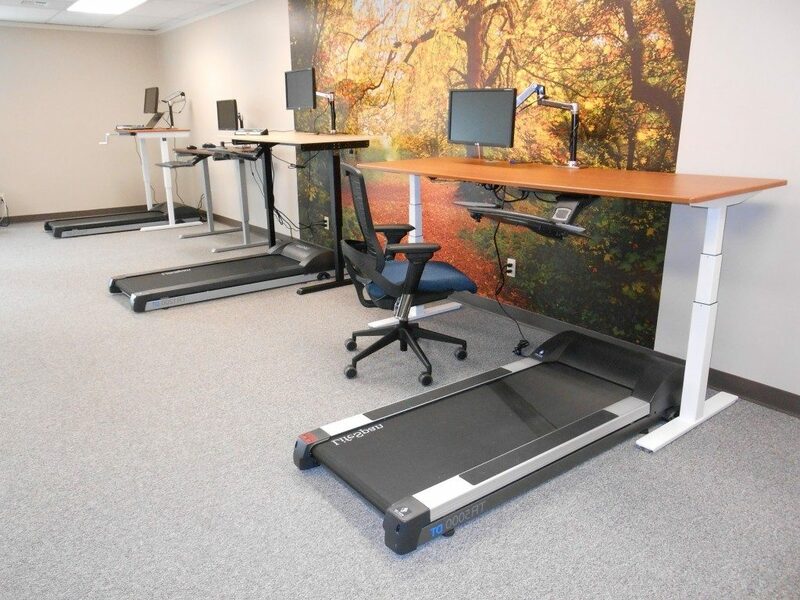 What we mean by this is that many companies, such as LifeSpan Fitness, have created standing desks for their treadmills, however, the products can still be used separately. This option is great for things like cable management, and also provides you with a larger console that sits near the front edge of your desk without getting in the way. This larger console can give you readouts such as calories burned, distance, time of workout, and step count. Standing desks for treadmills like the LifeSpan TR1200 have a great built-in console and fantastic cable management. When we are talking about maintenance, the first thing you should know is that you need to lubricate your under the desk exercise equipment on a regular basis. To prevent friction, you need to be sure to lubricate the deck every time you feel the friction has built up and as soon as you experience any hesitation upon stepping on the belt. In addition, you have to clean all the dirt that has accumulated in the part between the belt and the deck every couple of months or so. Also, it is advisable to use a separate pair of sneakers that you will be using only for walking on your under desk treadmill in order not to cover it in any excessive dirt. Another recommendation is to remove the covers occasionally and carefully clean the motor to prevent any dust from getting into the windings and shafts. Under the desk exercise equipment which has internal cooling fans needs to be cleaned regularly, as they can draw a lot of dust. Last but not least, although it might sound quite logical, always make sure you’ve vacuumed not only around the treadmill but also underneath it as well. If you want to increase the lifespan of your desk treadmill products, you always need to take care that the dirt doesn’t get into the motor. When choosing which under the desk exercise equipment to purchase, bear in mind that the majority of manufacturers will provide you with a lifetime guarantee for the frame when; in fact, you should be opting for the controller board and motor warranty, since they are much more likely to break than the frame. Look for an under desk treadmill unit which has a 3-year guarantee on the motor, and minimum 2 years on the electronics. If you don’t have a guarantee and your treadmill breaks – it would be cheaper to just get the new one than spending money on repairing it. Ultimately, before buying the unit, do some research on the warranty terms and if there are any additional costs related to service or maintenance. Now that we have covered the most important features that you should pay attention to upon your purchase, there are some smaller features that are less important in the buying process, but worth understanding nonetheless. We already talked about how torque is crucial, and how horsepower is a deciding factor for your treadmill. That is pretty much the only motor specification you should pay attention to. Manufacturers most often come up with all kinds of statistics that will show how their desk treadmill products are better than the ones of the competitors but don’t get too bogged down in all the information, just make sure that the HP is sufficient and the warranty is long, and you’re good to go. Provided that you will be using your under desk treadmill for walking, the incline doesn’t play an important role, since your goal is not to sweat or exercise excessively. If the model you chose does have an incline function, it will raise the whole treadmill off the ground a bit, so remember to factor this in when setting the standing desk height. Many manufacturers will offer you to spend a bit more on your under desk unit if you want it to include some performance statistics, such as a tracker for burned calories. We like certain features such as time, distance, and calories, as they give you a sense of achievement and help keep you motivated during the workout. These additions are more of a luxury and by no means a necessity, so we recommend to choose the product for its other features first before making decisions based on the tracking features. Every time we intend to buy something, the price is usually the most crucial factor to take into consideration. The cheaper standing desk treadmills are approximately $500, while the more expensive ones will reach as high as $4000 (usually including the desk and the treadmill as a set). As always, you get what you pay for and the expensive products will have more features than the cheaper ones, however, these are not required for every user. Just make sure you are getting a product that suits your lifestyle and fitness goals without breaking the bank. The weight limit of your treadmill is an indicator of its general capacity. Most units will provide an upper weight limit that the motor can handle. In general, it is recommended that you select a weight capacity that is 50 – 100 lbs heavier than you are, just to make sure the treadmill can function correctly. Treadmills are heavy! Make sure that when you buy yours it has suitable ways of transporting. Many have wheels attached so you can simply wheel the base out from under your desk. If you go for a fixed treadmill desk, it is most likely that you won’t be moving it too much, so portability shouldn’t be such a large issue. To sum up, before deciding to invest in office workout equipment, you need to conduct thorough research. Be certain to include all of the above mentioned essential factors when brainstorming and don’t get distracted by too many facts and figures, just look for products which tick all the right boxes we mention above. Choose something that will be the most practical and convenient solution for you, and turn the time spent in your office into a healthy activity!